Back in June we told you about our exciting new tool called Competitor Monitor. Providing ecommerce businesses with a means of monitoring their competitor’s prices, this side project of ours has seen unprecedented growth in its first year of operation. In order to continually add value to our current and future customers, Inovica have been investing heavily in the development of the software and are only days away from launching a brand new feature called ‘product matching’. ‘Product matching’ takes the standard competitor price monitoring service a step further. Not only does it monitor your competitor’s websites for price and product changes, the system now ‘matches’ up identical products across all websites, including your own. This means there is no need to drill it into other sites or reference your own prices in order to get an idea of pricing for a particular product across the board. The process to match the products is something the developers have been working hard towards making as easy as possible, the result being a ‘multi-site matching’ method, which seriously trims down the amount of time the product matching takes. So far, an interesting range of business sectors have started using the service, from car dealerships and baby clothes to dj equipment and multimedia products. The same applies to all of them, they have too many products and competitors to keep track of manually, and even if they could, they would struggle to make sense of all the information. 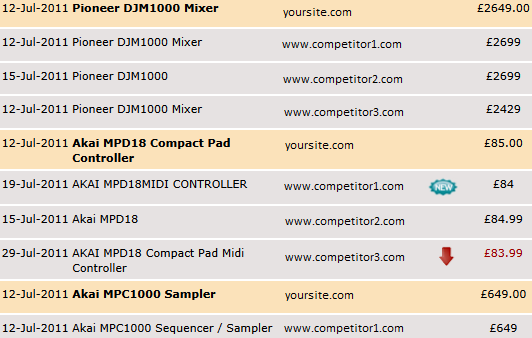 Competitor Monitor does all that for you. This addition makes Competitor Monitor an even more valuable tool to ecommerce businesses by providing a substantial competitive edge, allowing for an almost instant increase in sales. Visit CompetitorMonitor.com to get instant access to a free 14 day trial account to see how it all works.